Jane’s Delicatessen in Tulsa mixes the traditional with the contemporary. You wouldn’t expect to get the best pastrami in town from a guy who grew up watching his grandma can homemade preserves on a farm in Kay County, but Dane Tannehill, owner of Jane’s Delicatessen in Tulsa, is obsessed with getting it right. 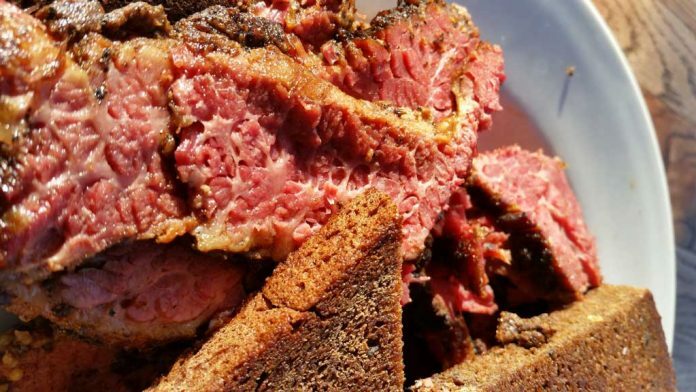 That pastrami takes almost two weeks to make. He uses only the point of the brisket, soaks it in brine, rubs it with spices, cold-smokes it for hours and, finally, braises it in steaming vegetable broth. It melts in your mouth, pops with flavor, makes you smile. Tannehill crafts bagels, too, with the same care and dedication. He makes the dough, lets it rise, then cuts and refrigerates it overnight. The bagels are then boiled with baking soda and popped in the oven for authentic New York taste. And where else can you find a delicatessen that offers pierogies, Canadian poutine and entrees like Cornish hen in beet wine glaze? There’s something for everyone at Jane’s. Visit janesdelicatessen.com for hours of operation and menus.